Scarlets coach Wayne Pivac said Leicester was a "bridge too far" after his team was heavily beaten in the European Champions' Cup. 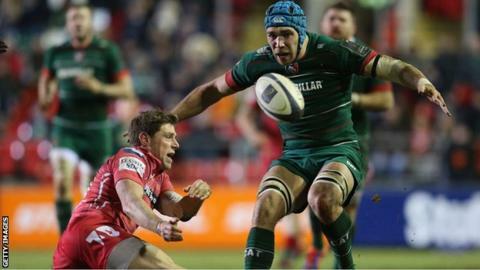 Leicester scored six tries in a 40-23 win at Welford Road, effectively ending Scarlets' chances of reaching the knockout stages. The Welsh region won the first meeting between the sides this year, but Pivac acknowledged the Tigers' superiority. "They were very clinical and they punished us," he said. "At the end of the day it was a bridge too far for us, and the penalties we gave away in our own half they kicked to the corner and they punished us. "They were really good in that department." Scarlets had been in touch at half-time after prop Rob Evans' try brought them back to within three points of the Tigers. But Leicester's power and strength-in-depth brought them a bonus point as they took advantage of the visitors' weakened match squad. The Scarlets were without Wales internationals Samson Lee, Ken Owens, Emyr Phillips from their front-row roster, with Liam Williams a conspicuous absence at full-back. Pivac took some crumbs of comfort from his side's determination in the second half. "It was very pleasing to see our guys keep working away and scoring another good try towards the end and nearly a fourth," he added. I'm obviously disappointed with the tries from set-piece, but the rest of the game I thought the boys played pretty well. "But the he injuries hit us with the replacements and the strength of their bench." Scarlets play defending champions Toulon in their final Pool Three game at Parc y Scarlets on 24 January.